Home › praying › WOMEN AND VEILS: ARE CHRISTIAN WOMEN TO WEAR VEILS? WOMEN AND VEILS: ARE CHRISTIAN WOMEN TO WEAR VEILS? Why do women in churches not wear veils? I mean, in some churches they do, but mostly not. Is this an instance where the Word of God is being ignored? Well if anyone thinks that, as a matter of conscience she should wear a veil and no one would think anything different. And if a man really believes it is a requirement of God, he would at least ask his wife and daughter if they shouldn’t wear the veil. Mostly, this is an issue for debate rather than a sincere desire to observe the practice: “you don’t wear veils, therefore you have no authority to say what other churches can or can’t do.” I have rarely encountered a person who has seriously studied the issue. Some do and have concluded that women should wear some kind of covering, at least when teaching the Scriptures. But mostly when it’s been brought up to me, it’s not been for any reason but to score a point that we in the church don’t agree in the church of Christ. The person doing the arguing isn’t of the mind to introduce veils; only to argue. But regardless of the motive of these people, it is still worthy of being studied. It does seems that the burden is upon the church today to explain why Christian women are not wearing veils. This verse in the Corinthian letter says they are to, right? Notice the context. The instruction to “every woman” applies only to those who are “praying and prophesying”. If “every woman” was engaged in praying and prophesying, then every single woman would need to follow the practice of wearing the veil. But those women who are not praying and prophesying, the veil is not an issue, not according to Paul’s instruction here. But some will say, isn’t every Christian woman praying in the assembly? Doesn’t that fact mean that the women today should be wearing veils? No, not in my opinion. This section of text, including the “praying and prophesying”, covering regulations in the church (11:16,17), continues through chapter fourteen. At the end of chapter 14 the women are told they are not to speak/teach in the church. In the assembly, the women would not be praying and prophesying, things which required the veil. The praying and prophesying of chapter 11 and onward are a function of the prophets and prophetesses who have special gifts for leading others in the Word of God. In the assembly, the prophetesses would be silent and therefore would not be speaking up in this way. The only setting where the prophetess would be teaching and prophesying was outside of the assembly of the church. The “praying and prophesying” by the women, i.e. leading others in these supernatural gifts, was forbidden in the assembly because women were to be silent. When the the Prophetess prays and prophesies with her head covered, she also must limit these activities to those teaching situations outside of the general assembly of the church just as is described in 1 Corinthians 14. Strictly following what Paul says in our passage above, the women who were not “praying and prophesying” were not enjoined to wear the veil. The non-gifted women were not under consideration. The “praying in the spirit” and “praying with the mind” are showing that this is not the same praying that most of us think of when we say “let’s pray” in the assembly. There is the prayer of non-gifted women which is not the function of a prophetess. Paul’s reference to “praying” in the 1 Corinthians 11 passage above is not the general prayer. It is the supernaturally inspired gift of the Prophet or Prophetess. This was supernaturally inspired and guided so that the foreigners could also be led in spiritual activities. “Therefore if the whole church assembles together and all speak in tongues, and ungifted men or unbelievers enter, will they not say that you are mad?” (1 Cor. 14:23). These regulations concerning tongues, singing, and praying are related to the “praying and prophesying” in 1 Corinthians 11 when the veil was to be worn. 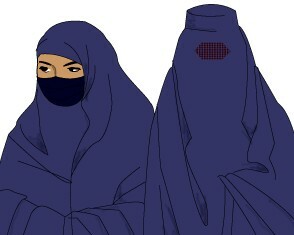 Whether female Christians in general are to cover their heads is not the discussion. In chapter 11 and following, Paul talks about the unity and order to be in the church which requires that the prophetesses abide by their role and be subject to men who are the spiritual leaders in the church. A gifted woman, without this instruction, might take it upon herself to begin preaching and leading the assembly. Chapter 14 shows she may not do this. Therefore she may do her “praying and prophesying” in other gatherings of woman or non-Christians: hence, in places outside of the assembly; hence, in the assembly veils aren’t an issue. here “praying” supernaturally by the Holy Spirit. In 1 Corinthians, the context of chapter 11-14 is related to the supernatural gift of “praying” in the spirit and in the mind. A Prophetess who is spreading the truth through “praying and prophesying” had to wear the veil, A woman not acting in a teaching/leading capacity would therefore not be required to. I understand the veil was not a small veil. It was a full head covering. Here is where I believe we are. If a case could be made for the veil regulation still being in place, it would most surely be a requirement for women in churches where they lead prayers and preach. If there were Prophetesses today, but there are not, then they would be required according to the teaching in the Corinthian letter to wear the veil when “praying and prophesying“, which would be a regulation for their teaching outside of the assembly because of the restriction placed on them by Paul in chapter 14 for them to be silent in the church. So this requirement for a veil would not apply to women at church – not in the first century and not in the 21st century. Accepting your article as a Given, one can understand why those women who were prophetesses and why those who prayed supernaturally would need to hear this instruction. The question is then, why is the instruction included in God's Word so that it is revealed to us today? What is the application or what can be learned from it for our Christian lives? Without prophetesses, this requirement concerning veils would be passed away. Or could it be that women teachers, though not supernaturally endowed, should also wear veils? Hmmm…. I have never given it deep thought but your study on the issue makes sense. That said, the requirement would be passed away. I just wonder if there is anything esle for us to learn from it beyond that those women wore a veil when praying and prophesying. They wore a veil but those gifts no longer exist so the requirement does not apply and has not applied for a long time. Was it merely written for the time when it did apply? There is no indication in the passage that the praying referred to was a public prayer in an assembly. By your interpretation a woman should be covered if leading a prayer or conducting a women's Bible study outside of the church assembly which I am quite sure is not occurring in most instances. Our church has interpreted it to mean whenever a woman prays or speaks of spiritual things which includes participation in minister-led prayer or spiritual conversation in church. This also includes covering one's head when praying or speaking spiritually outside of church which is why most of the women in our church wear a head covering of some sort at all times other than when sleeping or bathing. Hi Bob, I'm not sure which passage you are referring to but 1 Corinthians 14 context is worship and the women are told that they may not speak in the church – that would include leading song, prayer, preaching. So 1 Cor. 11, written to the same church tells the women to cover their heads when praying and prophesying. This requires therefore that their praying and prophesying is outside of the church assembly. So when the women are IN the assembly, there's no requirement for head covering – since they aren't praying and prophesying. But you might say, the women are praying in the assembly. Yes, but they are not leading and speaking out their prayers or they would be violating what Paul said at the end of chapter 14. Also, the praying of 1 Corinthians 11 is not general prayer, but it is the praying of a prophetess. It is like the praying of 1 Corinthians 14 where Paul says, “I will pray in the spirit, and I will pray with the mind.” The praying in 1 Corinthians 11 is the special supernaturally inspired prayer just as the prophesying is. Following the specific guidelines given to the prophetess in 1 Corinthians 11 and 14 means that when she's not praying and prophesying, she's under no obligation to wear the veil.